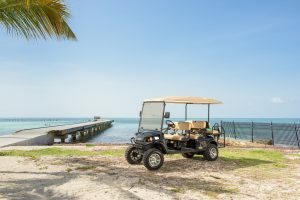 If you are looking for a great way to get around the island with nimble ease and open air style, a Key West gas golf cart rental from Pirate Scooter Rentals Key West is the way to go. Our gas golf carts seat four or six passengers, are fast enough to be allowed on all the island roads, compact enough to wind through the tight streets of Old Town, and have the unlimited range that only a modern, eco-friendly gas powered engine can offer. Feel the sea breeze in your face, enjoy open-air views, park in the tightest spots, and hop on and off with ease on the ideal touring machine: a gas golf cart from Pirate Scooter Rentals. These stable, road-worthy golf carts feature all-terrain traction tires and generous ground clearance to make for a smooth, comfortable ride. A Key West gas golf cart rental is the ideal choice if you are planning to take in major historic attractions like the Harry Truman Little White House, Ernest Hemingway’s house, and Fort Zachary Taylor Historic State Park. Move between destinations with speed and ease, leaving more time to spend enjoying the spots that have made Key West famous. And save even more time with free customer pickup that puts you in the driver’s seat within minutes at one of our two great Pirate Scooter Rentals locations in the heart of Key West. At Pirate Scooter Rentals, all of our Key West gas golf cart rentals are top quality, perfectly maintained vehicles. We proudly offer the newest vehicles. Fully automatic and easy to drive, every gas golf cart rental comes with free instructions and complementary gas and oil refills. Our friendly staff will ensure that you are on your way to safe and enjoyable island touring, and they are always ready to offer inside knowledge of the island’s highways, byways, and top sights to see. Make the most of your time in Key West with a gas golf cart rental from Pirate Scooter Rentals. Pirate Scooters has locations just off Duval Street and a block from the Key West Cruise Ship Dock. Save the cab ride! Call for a Free customer pickup from anywhere on the island Key West and Stock Island. We are proud to say we replace our large inventory of scooters, electric cars and bicycles on a regular basis. Save The Cab Fare, Free customer pickup!